Long-lasting* restructuring care, conditioner for very damaged hair. Especially designed for very damaged hair fiber and cortex, the PRO FIBER Recover range from L’Oréal Professionnel creates a long-lasting effect of reconstructed hair, leaving the hair fiber feeling new from roots to ends. Hair is stronger, intensely soft, shiny, smooth and with a lightweight feel. Following your PRO FIBER Recover routine in-salon, continue the hair treatment at-home, to prolong the effects of the APTYL 100 molecular complex on the fiber. * Instrumental tests after the salon routine – up to 4 Pro Fiber shampoos (Revive/Restore/Recover). 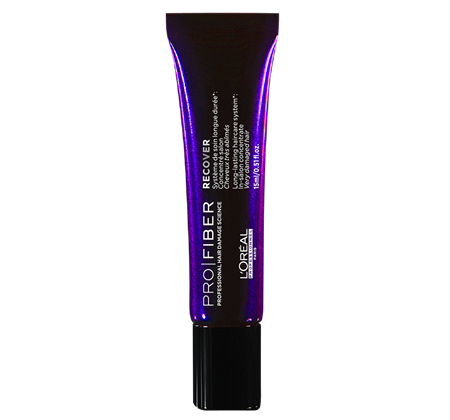 Click here to find out more about PRO FIBER Recover Conditioner on the Official L’Oreal Professionnel Website. Long-lasting* restructuring concentrate for very damaged hair for the in-salon Recover protocol. Used in salon-as part of the PRO FIBER Recover protocol. Applied by the hairdresser before the REGENERATE long-lasting* Care activator, the technical masque, according to a professional layering technique. The hair is replumped and controlled, radiating vitality. New fiber effect from roots to ends. The fiber is strong, intensely soft, shiny, smooth and light. Hair is repaired* and healthy again. * Instrumental tests after the salon routine – up to 4 Pro Fiber shampoos (Revive/Restore/Recover). Click here to find out more about PRO FIBER Recover Concentrate on the Official L’Oreal Professionnel Website. Long-lasting* restructuring care, serum-in-cream for very damaged hair. Hair is replumped and controlled, radiating vitality, healthy again and repaired*. New fiber effect from roots to ends. The fiber is strong, intensely soft, shiny, smooth and light. Following your PRO FIBER Recover routine in-salon, continue the hair treatment at-home, to prolong the effects of the APTYL 100 molecular complex on the fiber. * Instrumental tests after the salon routine – up to 4 Pro Fiber shampoos (Revive/Restore/Recover). ** Auto-evaluation of 333 women using the Pro Fiber Revive and Recover ranges for 15 days. 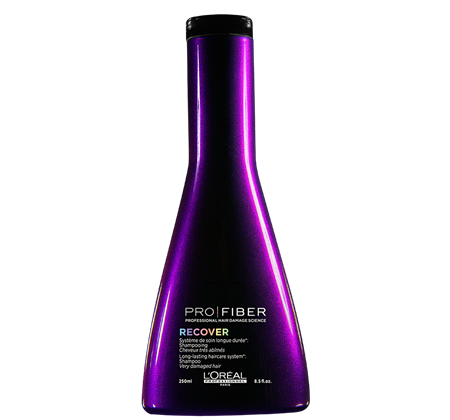 Click here to find out more about PRO FIBER Recover Leave In on the Official L’Oreal Professionnel Website. Long-lasting* restructuring care, mask for very damaged hair. 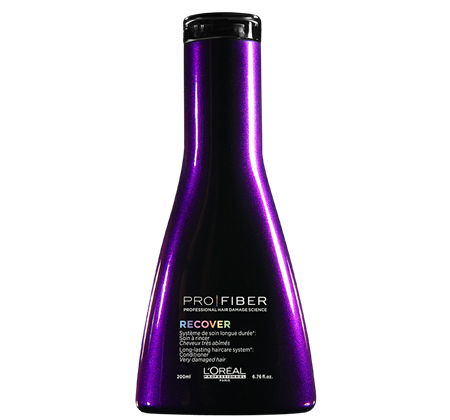 Especially designed for very damaged hair fiber and cortex, the PRO FIBER Recover range from L’Oréal Professionnel creates a long-lasting effect of reconstructed hair, leaving the hair fiber feeling new from roots to ends. Hair is healthy again, replumped, repaired** and controlled. When dry, hair is noticeably more supple, silky soft from root to tip and detangles easily. New fiber effect from roots to ends. The fiber is strong, intensely soft, shiny, smooth and light. * Instrumental tests after the salon routine – up to 4 Pro Fiber shampoos (Revive/Restore/Recover). ** Auto-evaluation of 333 women using the Pro Fiber Revive and Recover ranges for 15 days. 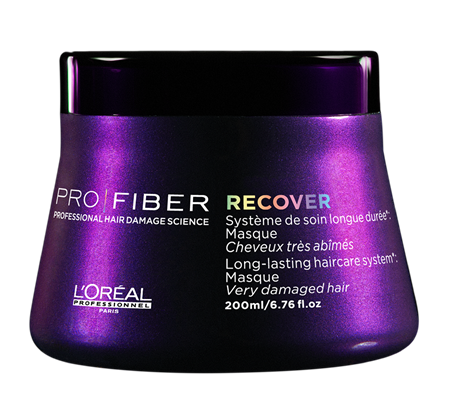 Click here to find out more about PRO FIBER Recover Masque on the Official L’Oreal Professionnel Website. Long-lasting* restructuring care, shampoo for very damaged hair. Following your PRO FIBER Recover routine in-salon, continue the hair treatment at-home, to prolong the effects of the APTYL 100 molecular complex on the fiber. Use the Recover Shampoo with the dedicated Recover routine (Conditioner, Masque and Leave-In). Do not forget every 4th wash to apply the RE-CHARGE monodoses to extend the lasting effects of the treatment. Damaged hair is replumped and controlled. When dry, hair is noticeably more supple and silky soft from root to tip. * Instrumental tests after the salon routine – up to 4 Pro Fiber shampoos (Revive/Restore/Recover). 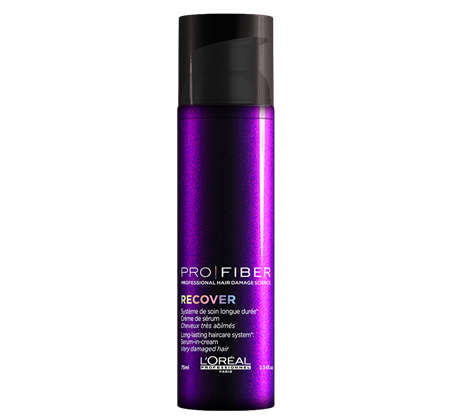 Click here to find out more about PRO FIBER Recover Shampoo on the Official L’Oreal Professionnel Website. Long-lasting* repairing** care, shampoo for damaged hair. Reactivate your professional in-salon PRO FIBER Restore treatment by continuing with the recommended at-home routine. Experience that intensive and active hair repair treatment, again and again, at home. Hair detangles with ease and hairstyling becomes a dream. The hair fiber appears resurfaced, leaving it feeling soft with an impressive shine. Don’t forget to apply the RE-CHARGE Monodoses every 4th wash to extend the lasting effects of the treatment. * Instrumental tests after the salon routine – up to 4 Pro Fiber shampoos (Revive/Restore/Recover). **Auto-evaluation of 333 women using the Pro Fiber Rectify and Reconstruct ranges for 15 days. 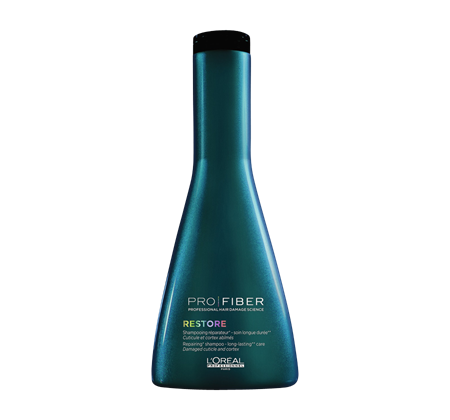 Click here to find out more about PRO FIBER Restore Shampoo on the Official L’Oreal Professionnel Website.